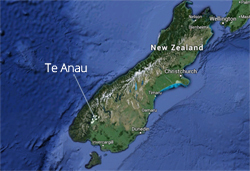 It's no surprise that couples decide to get married in Te Anau or Manapouri. Getting married in Fiordland is a simply magical experience. In Te Anau, there's a fantastic glass chapel right on the lakefront operated by Distinction Te Anau Hotel & Villas. The chapel has a wonderful view of Lake Te Anau and the Kepler and Murchison mountains. The hotel offers complete wedding packages. If you really want to get married in Fiordland, then what better way to do it than actually in the national park itself. Take a helicopter up to a mountain top and do it there, as demonstrated in the photo above! (Probably a good idea not to put a veil on until you are well away from the rotor blades though...) There are several marriage celebrants in Te Anau who can accompany you and make it official. You can of course also get married in the many churches in town. See our services directory for churches.